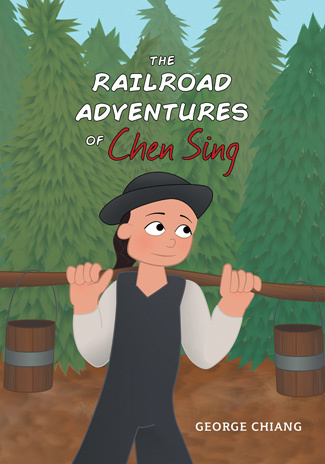 George’s book, The Railroad Adventures of Chen Sing has received rave reviews and numerous awards. He is currently working on its sequel, The Pioneer Adventures of Chen Sing. The Railroad Adventures of Chen Sing is a story about a teenage boy from China who ventures far across the world to help build the transcontinental railway through the rugged Rocky Mountains. Natural disasters, wild animals and unforeseen events together with the seemingly endless mountains of rock are among the obstacles that stand in the way of Chen Sing and his railroad crew as they bravely forge ahead on their quest to complete the railway. Buy it on Amazon.com (all 3 formats available), Amazon.ca (all 3 formats available), iTunes (eBook), Google Play (eBook), Chapters.Indigo.ca (hardcover and paperback), and Barnes & Noble. "The Railroad Adventures of Chen Sing is not only a good introduction to an intriguing period of social history—particularly the relationships between Chinese workers and indigenous people—but it also provides important moral lessons about the value of drive, friendship, perseverance, and being true to oneself. Chen Sing is not only a great role model but an entertaining one, with his enthusiastic embrace of his newfound home, hardships and all." "I enjoyed “The Railroad Adventures of Chen Sing” by George Chiang very much. It has a great message of how a young boy had to be brave with such a great loss at such a young age and had the strength to work so hard to survive and help his older brother and younger sister. I loved the pictures, and the writing and how in a short story you will find so much entertainment. I think this adventure will be both enjoyed by younger and older readers." "I loved (the) book! I’ll definitely be using it in the classroom. I’ve read a fair bit about the railroad, but (the) storytelling makes it fresh, relatable, and emotionally gripping."